Our most recent trip to the Charente started in Montemboeuf so that we could visit our plot. This was the first time that we were able to stand there and say, ‘this is ours’! It was quite a good feeling and very exciting to know that we had got this far. We were there to take a survey of the land and measure the changes in levels, as well as plot where all the trees were and make a note of what species there were. It was great to see the land looking in great condition, maybe that has something to do with the sheep – and as we found out later from the man himself, a local farmer, who has been keeping and eye on things, cutting back the verges and stacking wood for us! Very kind of him, especially when all we are doing is letting his 4 sheep graze the land! It seems like a win win situation! The trees were laden with fruit while we there it was a shame we couldn’t take it with us. In the hope that not all of it goes to waste we told the owners of our friendly B&B to help themselves. 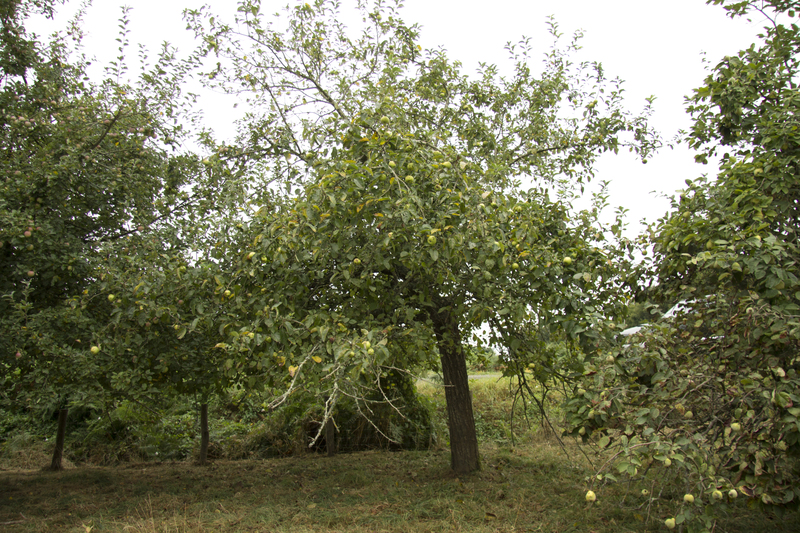 We worked out that we have apples, quince and hazelnut trees – wonderful! After our flying visit to Montemboeuf, it was off to Confolens to meet the regional architect and the local planner to discuss our designs. One of our biggest fears was that they would ask us to site the building nearer the road which would mean cutting down some of those amazing trees. Our fears were completely allayed when the architect asked us if we planned to keep the trees. When we told him that we did and that the plan was to site the building further down the hill, he was very pleased! The meeting could not have gone better, they liked all of our plans and designs and the only comment the architect made was that we should use natural wood if we decide to clad in timber. The architect is going to write us a letter of recommendation to go with our planning application! Fantastic news. Although, next step will be to write that application and send it to the Mairie in Montemboeuf. Luckily the planner has offered to help us if we need it. The architect also recommended that we make contact with a group called Futurobois. They are a professional association of timber companies in the Poitou-Charentes region. They include firms that deal in everything wood from logging, to architects, to mills, coopers, carpenters, etc – a very important group of people to know if we do decide on a timber construction. Our next stop was to meet some builders. Tom had set up a meeting with a local company called Bati Paille-Constructions. These guys are specialised carpenters who build low ecological housing and build with passivehaus consumption principles – and they are 30 minutes drive away! We were both really impressed by their design and knowledge and clearly a lot of other people are as well because they are busy until September 2014! We are also impressed by their time scales – the house would be pre-fabricated in their factory which takes about 6 weeks. It then takes them about 2 weeks to put the building up and make it watertight! Tom plans to send our designs to them so that we can get a quote…..so quite a lot to be getting on with before our next trip! 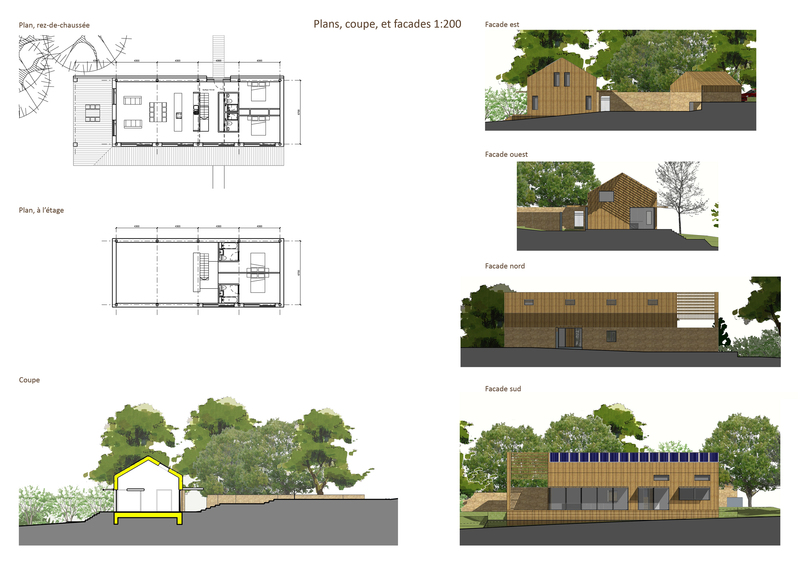 Categories: Montemboeuf Plot, Planners, Planning | Tags: Architect, bati paille construction, French planners, Futurobois, passivhaus | Permalink. How exciting! I read with great interest your progress. bon courage! Bien à vous deux! It is exciting! Tom is just putting the final touches to all our planning documents before we submit, so fingers crossed. Thanks again for all your help with getting us this far.